If you need to have something put together, I’m probably the last person you should ask for help. First of all, I am a typical guy. I avoid directions at all costs. Then, too, even if I get something put together so it functions properly, I’m apt to have at least one part left over. If I’m trying to fix something, I’ll probably have more than one. Let me tell you about the lawnmower pictured above. It came basically assembled, thank goodness. If I recall correctly, all I had to do was bolt the handle piece in place, position the rope from the pulley at the proper place on the handle, and attach the little shield covering the output opening. I got everything together. Apparently correctly since I didn’t have any parts left over. So I filled it with gas and oil and pulled the rope. I tried to, that is. But the starter wouldn’t. Wouldn’t start, that is. Turned out I’d failed to attach the rope’s handle to the mower handle. Hmm. Not a drastic problem. Except I couldn’t pull the rope out from the coil to do that. Okay, the coil assembly was fastened down by only three bolts. I removed them and did what I needed to with the rope so I could attach it to the mower handle. But I didn’t feel confident about whether it would start, so I didn’t fasten the bolts very tightly before starting the engine. 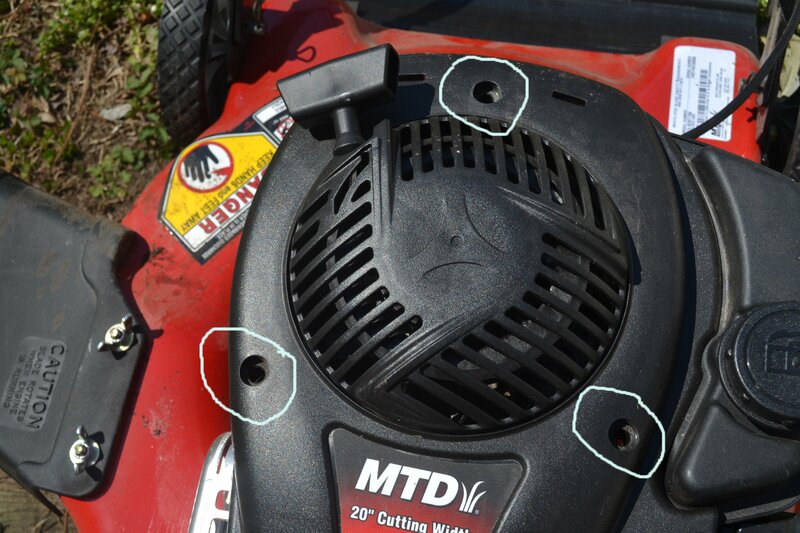 But running a mower with part of it held down by only three loose bolts has some potential problems. Specifically, I discovered I had only one bolt left. The chance of finding the missing two was zilch–or less; a metal detector might’ve helped, but we don’t have one. 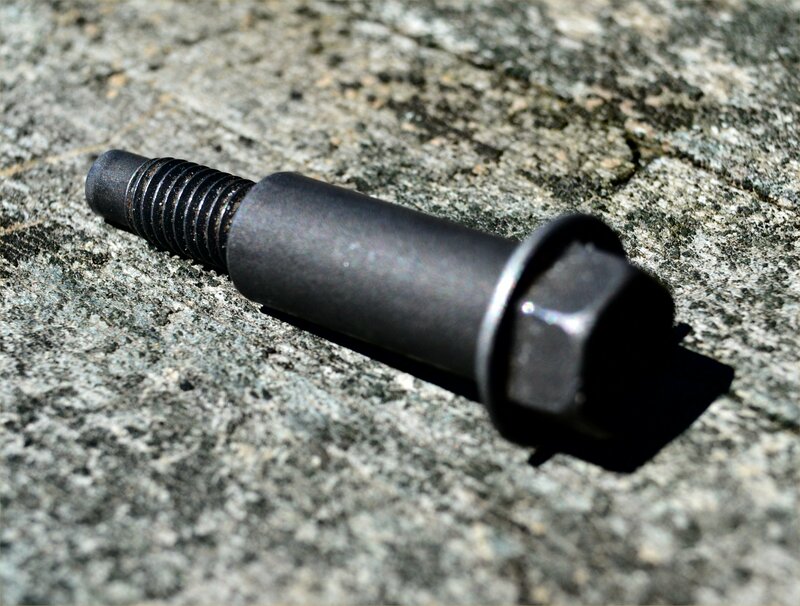 As you can see from the picture above, the bolt is not a normal you-can-find-it-at-the-hardware-store kind of bolt. I removed the one bolt I had and went to a mower repair place. Oh, but of course they couldn’t help without specific information about the mower that wasn’t written in the instruction manual I’d had the sense to take with me. 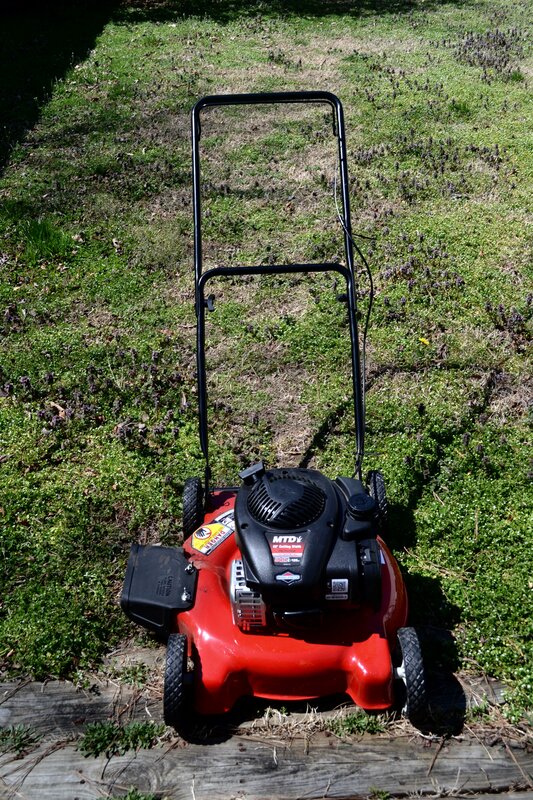 After two round trips to that place–they told me to bring the mower next time–I decided to quit for the day. As it turned out, I could start the mower easily enough if my wife pushed down on the coil assembly while I pulled the rope. Got the grass mowed. The last cutting of the season. I drained the gas and put the mower away. Yesterday, I decided to try once more to replace the lost bolts. My wife wouldn’t always be around when I needed to mow. So I removed the one bolt to take to a mechanic friend to see whether he could find a work-around. But doggoned if I didn’t drop the bolt coming into the house. Thank goodness my wife was able to find it, because I sure hadn’t been able to, and the prospect of finding a replacement or a work-around without anything to go by wasn’t good. I’d already loaded the mower into the trunk, but I gladly unloaded it again. And what did I find on rolling it up the ramp back into the shed but one of the two missing bolts! So I took one to my friend and have the other in my pocket. Yes, please don’t ask me to assemble anything for you. Not unless it’s supposed to self-destruct. Does my all-too-true story remind you of anything you’ve experienced? How about sharing in a comment? This entry was posted in Assembling, Bolts, Instructions, Mower and tagged As I Come Singing, Assembling Things, Free Christian Lead Sheets, Free Christian Song Lyrics, On Aging Gracelessly, Roger E. Bruner, The Devil and Pastor Gus. Bookmark the permalink.